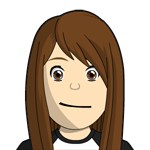 FurryP , I just created a post on my blog. I hope you find it helpful. Awww...thanks SO much! I will check it out. ETA: Wow that is some list. I will keep in mind you said we don't need everything. I am sure I have a lot of it already anyway. Also the comment about the professional vs basics Liquitex gesso. Good to know. I would probably have gotten the cheaper one. Thanks again. 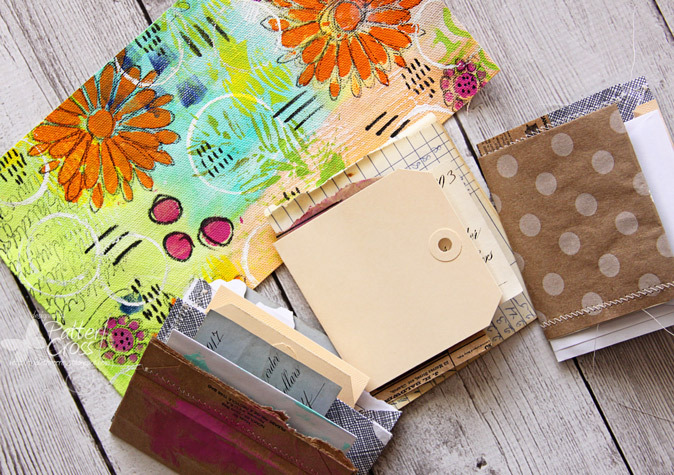 Love all your examples for mixed media with stencils, Patter. 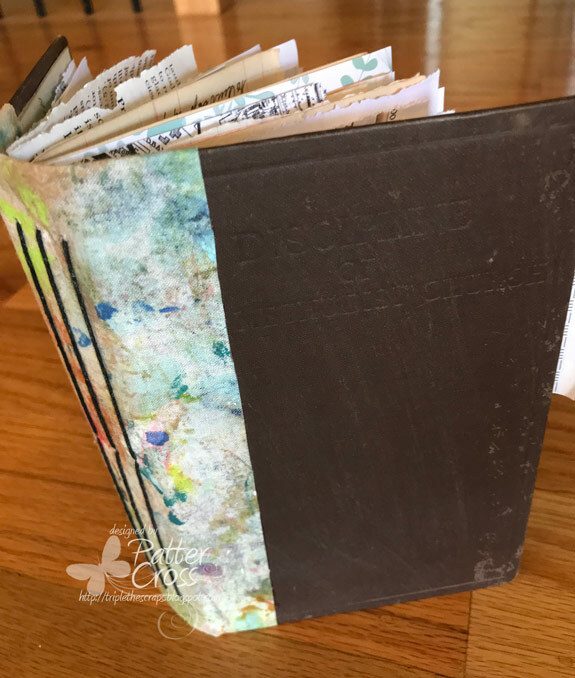 You create beautiful art journal pages. I am thinking I would like to try pour techniques for acrylics. justjac has turned out so many beautiful pieces and I have seen some lovely results on line. I also want to continue playing with my alcohol inks and Alcohol Lift Ink. FurryP , yes, you do not want to buy their cheap gesso. It is VERY grainy. Golden makes a wonderful gesso too; however, it's even more expensive. No reason to have that. This particular gesso is my "go to." Edited to say, yes, you probably have a lot of this stuff or can substitute something. Patter - your samples are beautiful! The orange flowers are beautiful. I'd really like to try hand lettering. Not the brush lettering I see everywhere, but just a really nice hand drawn lettering of some sort. Something I could incorporate into my scrapbooking. Does this even exist? Something like this? Scroll way down to see more of her style. There's even a small free class. 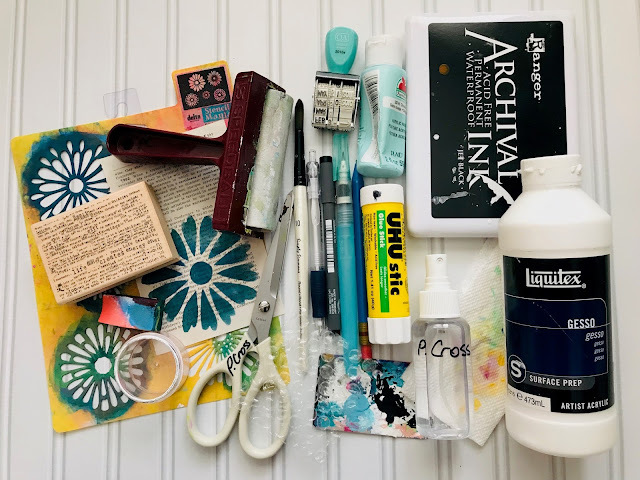 I'm going to crack open my Brushos - the ones I've been talking about using since I "had to have them" several months ago - and I'm going to make some galaxy backgrounds and then I'm going to make pretty watercolor backgrounds for cards. I used mine once when I first got them. I made a ton of backgrounds and did use them for cards. Good call on getting them back out. My friend and I did the Jennifer McGuire monoprinting technique. It was a lot of fun. My friend did turn hers into cards. My backgrounds I did not use yet. I had to get my atc's done so I worked on them. Those pinned layouts are amazing! somebody mentioned acrylic pouring- that looks intriguing to me when but I don't have the faintest idea what I would DO with any finished projects. They had kits at M's that included everything you'd need for a couple canvases, but the regular price was something like $80!!! Too rich for my blood, just to try something out that I might hate anyway. I just googled acrylic pouring. I hadn't heard of it before. Seems just too messy for me. 1. Put dab of paint on a palette (craft sheet or deli paper works too). 2. Using a makeup sponge, dab a bit of paint onto the sponge. 3. Pounce a bit of the paint off onto your palette. 4. Then pounce onto your piece through the stencil. Play on book paper, security envelopes, etc. You get great looking texture that way. Too much paint causes it to seep under the stencil and get yucky. If you just dab off and pounce, you can come up wth beautiful stenciled images. Have fun, and here is an example of some stenciled flowers I did with orange paint. Super fun and beautiful. I do this on almost everything I create. Great tips! Love those examples you show in the photo. Thanks for including them. I have several stencils and some acrylic paints and had the problem in the past with too much paint. I will give it a try with a sponge. 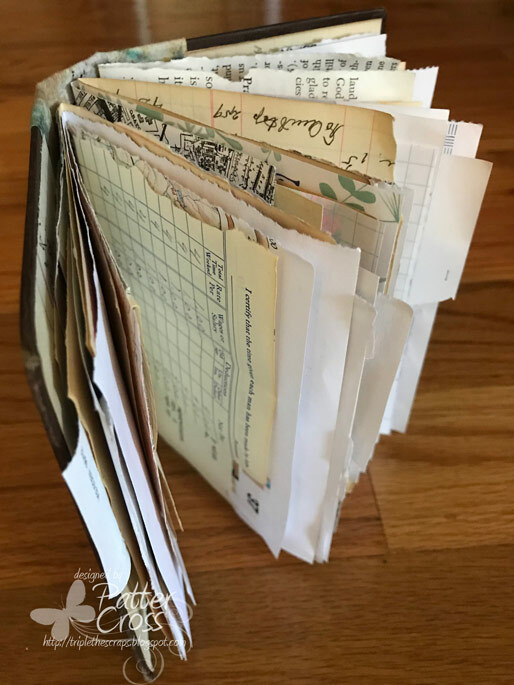 I have been watching a lot of youtube videos on making your own books or junk journals out of different papers (scrap paper, envelopes, mail, etc). I was thinking to try that at least once. Other than that I am with all of you ladies that said you want to USE what you have. I have a lot of stuff in my room and want to whittle down my stash. Glad you will give stencils and paint another try. And the book above that is in my photo is a junk journal. 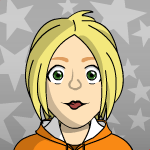 Here is another one I made. The difference between the two is one is an old book cover (below), and one is a painted canvas cover. I love making them! I’m late to the game, but recently started collecting Copics. So learning more about how to use them is on my list. I’d also like to figure out how to use my PixScan map to cut out my stamped images. I keep buying mixed media stuff but not really using it so I'd like to explore that thru the numerous you tube video tutorials I've saved. I'd like to get a bit more proficient with my sewing machine and scrapbooking. Me too. It’s time to stop watching videos and actually try making something. I also want to try using a gelli plate. Patter Those are amazing! They look so cool. I just checked out your website. Thanks for sharing! pas2 Totally agree about the gelli plate. I don't have one but have watched many a tutorial. I was just looking up the price of those the other day. I think this thread shows why scrapping needs NEW customers. Those of us who have been at it a (long) while, already have our supplies, our tools, etc. And we resolve to use them. But what the scrapping companies need is NEW ENTRANTS to the market. They're never going to get that by recycling the same 10 tired themes, 10 tired colors and throwing in a llama or a camel here or there. I just wish someone innovative was watching this industry waiting for a chance to breathe new life into it and engage the new 20-somethings and 30-somethings into a hobby that is a blast, a therapy and a functional way to remind ourselves of our experiences. I just bought one with my Christmas amazon gift card. $29.05 plus a 5% off coupon for a 9x12 plate. I was so excited to play with it this weekend but had to send it back because they squeezed it in a box way to small and crushed the packaging that doubles as the storage container. The plate was fine. Hoping it comes by next weekend. I had made one that was only ok for paint and didn’t work for alcohol inks. I now use it to apply matte medium to my ink jet printouts. I have the 8x10 and the 3x5. I use the 3x5 the most. They are fun but not my "go to." Hope you enjoy!